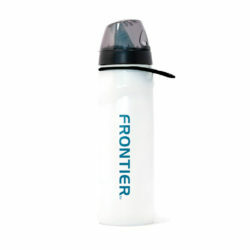 View cart “Aquamira Frontier Flow GRN Line Filter Water Bottle” has been added to your cart. Go the distance without concern for water in the backcountry with the Frontier Pro. This ultralight and compact water filter is certified to remove Bacteria, Cryptosporidium, and Giardia to EPA standards. The Aquamira Frontier PRO also reduces chemicals, chlorine, bad taste and odors and is certified lead free to NSF/ANSI-372 . The Frontier Pro is the best backpacking companion you can have. The Aquamira Frontier Pro ultralight water filter is the original multi use filter system. There have been many attempts to copy the functionality of the Frontier Pro but all fall short.. The ultralight compact design allow you to connect it to a Platypus® bag, use it terminal-end with your favorite hydration reservoir, or in a gravity flow configuration, it even converts to a straw filter or connects directly to a plastic water bottle. The Aquamira Frontier Pro is the only light weight multi function filter of it’s kind that is certified* to EPA and NSF/ANSI standards so you can trust the filter to perform as claimed. The Frontier Frontier Pro weighs in at only 2.5 ounces, fits anywhere, connects to most anything and is super versatile, all of which has made it the popular choice for lightweight hikers. The best part? It requires no backflushing, includes three pre-filters, has a replaceable GRN Line filter and patented bite valve with protective cap to keep it clean in the wild. The Aquamira Frontier Pro has been completely redesigned from the ground up starting with an entirely new, replaceable GRN Line filter certified by IAPMO to remove bacteria and cysts to EPA standards and do it at a higher flow rates than the previous version. Now you can change out filters as needed and carry spares at under an ounce each. Frontier GRN Line filtration is achieved using our unique 2 stage Electro-Positive Adsorption Technology. The replaceable pre-filter disk removes larger particles, then final charged micro-glass fibers “pull” organisms as small as bacteria out of the water stream while still maintaining high flow rates and low pressure drops. GRN Line filters have been thoroughly tested and are certified to remove protozoan cysts and bacteria to US EPA standards without the use of disinfecting chemicals such as chlorine, bromine, or iodine. The Frontier PRO is certified lead free (ANSI/NSF-372) and also reduces chlorine and harmful chemicals, bad tastes, and odors. The patented design of the Frontier Pro filter system includes the unique Cap Strap™ cap system to retain the cap and protect the patented Bite Me™ valve from contamination and provides a sure grip on the filter that fits comfortably in your hand. 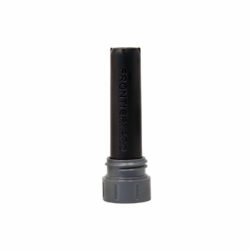 The UQC (universal quick connect) allows connection to standard quick connect fittings, found on most hydration systems. The 28mm threaded base connects to bottles and Platypus® flexible bottles. You will be amazed that a filter this small can do so much.